Web site people are always catching up. You get involved in an extended project and by the time you're done, they've changed the rules again and it's time to learn a new technology. I used to think this was a problem. Now I see it as a responsibility to manage the information of an ever expanding set of hardware devices that are becoming digital. 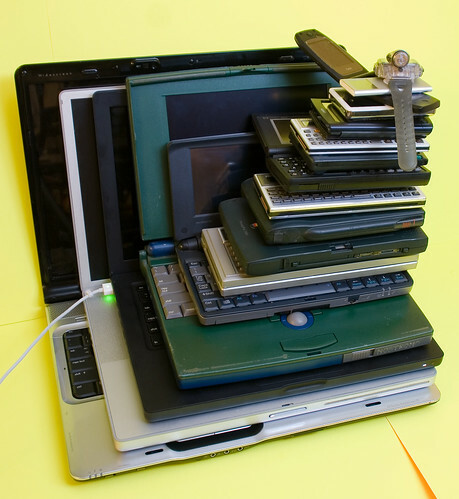 As these digital devices become of age, they mature into a web access point because of the value it adds to the device. Some devices like tablets are born with the ability to talk to the web at birth. Others, like DVD players, had to wait until they grew up. The raft of programming languages not originally focused on the web that try to manage that environment push the simple text retrieval process to be more app like. In their desire to improve the unique asynchronous request-response communication model, they, in my mind, will eventually destroy it. Face it, it's slow. You can do faster communication with AJAX which is why you see Google using so much of it on their web apps. It's why jQuery Mobile designed their GUI library for speed with AJAX so much that it's the primary communication model that tolerates the web request model. Languages are shifting little in popularity. A recent TIOBE trend announcement showing that the iOS platform language of choice, Objective-C, has been the faster gainer over the last two years to take the #3 spot on the chart, is the only major change. With Java trending downward and losing the lead to C, a venerable stalwart, I'm not seeing where anybody is picking up the slack. C# is on a slow trend upwards but not that much. Even php is losing ground. Excuse me now, I have to get back to the future and read about what's coming so when I start working again I won't be too far behind. If you find something worth talking about, please let me know. I'm always interested in what people are actually doing. Good luck! That was worth reading article about html5 and also about it future as well. I am very fond of knowing about the upcoming trends in IT, so keep sharing such good work.